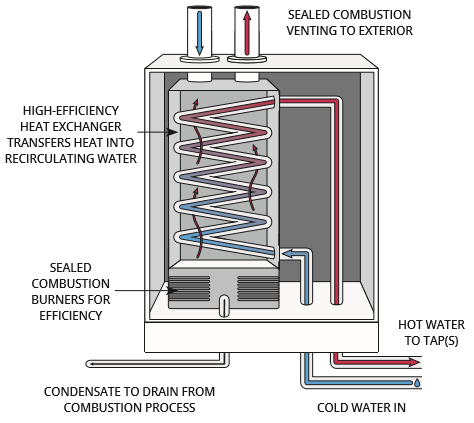 What are tankless/instantaneous water heaters? An ENERGY STAR® certified tankless water heating system is an efficient way to heat water, providing a constant supply of hot water only as it is needed for timely convenience, reduced energy use and space-saving design. Unlike a storage tank water heater that keeps a large volume of hot water ready to go at all times, tankless water heaters provide the amount of water you need, only when you need it. When hot water is turned on, cold water travels through a pipe into the equipment and either a gas or propane burner or an electric element heats the water that is distributed throughout the home. Tankless water heater fuel availability (electricity, natural gas, propane) varies across Canada.